You may need to eat a pureed diet if you have difficulty swallowing or chewing solid food. Swallowing or chewing problems can result from nervous-system disorders, such as a stroke, or accidents that affect the jaw. Your doctor may also advise you to consume more protein if your body is healing after surgery or if you need to gain weight. A high-protein pureed diet requires preparation and planning. Foods that are easy to puree include soft fruit, cooked vegetables, beans, tender-cooked meats, cottage cheese and cooked pasta. Avoid nuts, seeds, the skin of produce and stringy foods, such as celery. Chop the food into bite-size pieces. 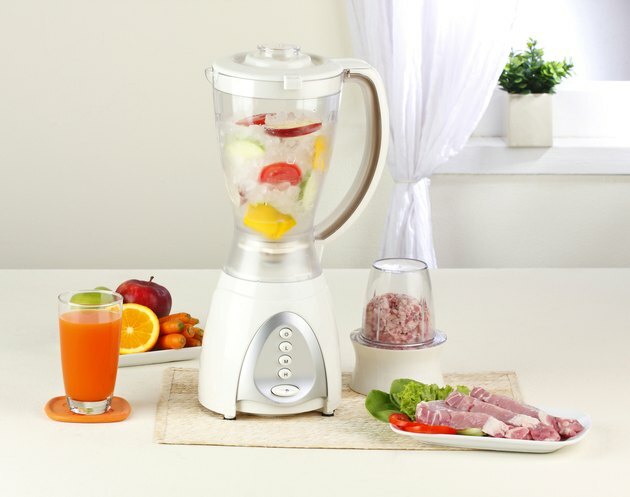 Add liquid, such as broth, milk, juice or a commercially prepared oral nutrition supplement to your blender or food processor. Place the solid food inside and blend until smooth. Pureed food should be the consistency of pudding. For breakfast, puree cooked oatmeal with milk or half-and-half and banana slices. Add protein powder or smooth peanut butter for additional protein. Boost your protein intake at lunch and dinner by pureeing meat, beans or cooked eggs with water, broth or gravy. Blend canned tuna with enough mayonnaise to make it smooth. Mix in soft tofu, milk powder or unflavored protein powder for even more protein. Add smooth peanut butter, yogurt or cottage cheese to your blender with fruit at snack time. What Are Soft Foods After Oral Surgery?